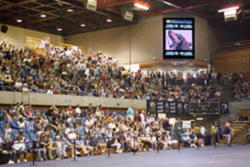 Debuting at the infamous Doxie Derby on Picnic Day 2004, "Big Boards" are a new feature of the Pavillion at ARC (formerly known as the Rec Hall). The IET-Mediaworks video group switches between 3 cameras in orger to feed video onto the giant screens on display for thousands of audience members. Adding to the energy of sporting events, the Big Boards allow for instant replays at various speeds and high-end graphics to accompany the images. The big screens gathered applause from the doxie derby crowd who loved the slo-motion replays of the little dogs at the finish line. Mediaworks will record many other Intercollegiate Athletics events (e.g., wrestling, gymnastics, basketball) in the future and will maintain a video library of these events, each of which can be reproduced for a small fee. Next up on the Big Boards agenda: UC Davis commencement ceremonies.